John Bunn was just 14 when he was jailed for the murder of an off-duty correction officer in Brooklyn. He was finally able to clear his name Tuesday, when a judge formally exonerated him after 27 years. He's 41 now. He wept as he hugged his attorneys in court. He approached the judge and held both of her hands and rested his head on the bench. "It has been 27 years, I've been fighting for my life and I've been fighting for my innocence," he said. Bunn served 17 years in prison before he was freed on parole in 2009. Two years ago, he won the right to a new trial. Now, prosecutors have said they won't retry him -- leading to a full exoneration. "I didn't deserve any of that stuff that you all did to me," Bunn said to prosecutors. "They won't admit and say that I'm an innocent man. But I'm an innocent man, your honor, and I have always been an innocent man," Bunn said in court. "You all convicted and had a wrong man in prison, and you all still have somebody on the loose that killed someone." Rikers Island correction officers Rolando Neischer and Robert Crosson were shot while sitting in a car at a Brooklyn housing project at around 4 a.m. on August 13, 1991. The suspects were two men who wanted to steal their car, according to court documents. Neischer was hit five times and died from his wounds. Police got an anonymous tip that led them to Bunn and his co-defendant Rosean Hargrove, who was 17 at the time. Crosson identified the two men in a photo lineup and was the only witness at their trial, which lasted just one day. Two bicycles were found at the scene along with blood and multiple fingerprints. During the appeal, a district attorney, who reviewed the case testified they didn't match Bunn or Hargrove, according to the documents. 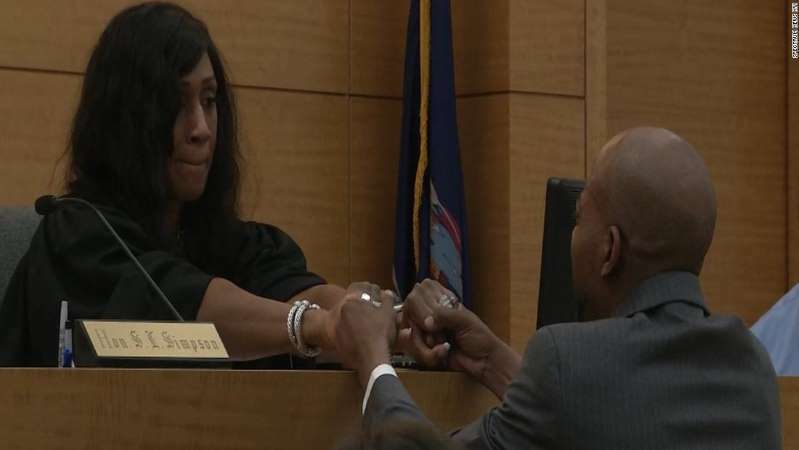 During the proceedings Tuesday, the judge place much of the blame on a disgraced former NYPD detective, who's been accused of framing suspects during his career. Prosecutors have reviewed dozens of his cases for possible malpractice. She also criticized the way the justice system handled the case. "In one day they picked a jury, they had openings, they had witnesses, and a conclusion on a murder trial which I do not consider justice at all," Judge Shawndya Simpson said. Bunn's lawyers told reporters he deserved an apology. "It would be nice to have that stated to him so that he could really feel fully vindicated, but we don't have that and it is unfortunate they didn't go there," said Glenn Garber, the director of the Exoneration Initiative. Hargrove's conviction has also been thrown out and he won't be retried. Bunn told CNN affiliate WPIX that he taught himself to read in prison. In the years since his release, he has collected more than 20,000 books for New York inmates, he said. He created the A Voice 4 the Unheard literacy project last year. "I just feel overly blessed and thanking God that we reached this point," Bunn told reporters outside the courthouse.